Today students of seven faculties started their fifth day of boycott and occupation of the University of Tirana. They have refused to meet officials of the Ministry of Education. Here is a quick review of the situation in several faculties today. More than 200 students of the Faculty of Economics have been occupying the faculty since Friday. They spent the nights in cold following administration’s order to turn off the heating system. The occupying students of the Faculty of Law were joined in their protest by students of faculties of Social Sciences and Natural Sciences. Faculty of Medicine and Faculty of Architecture students also decided to boycott and occupy their faculties. 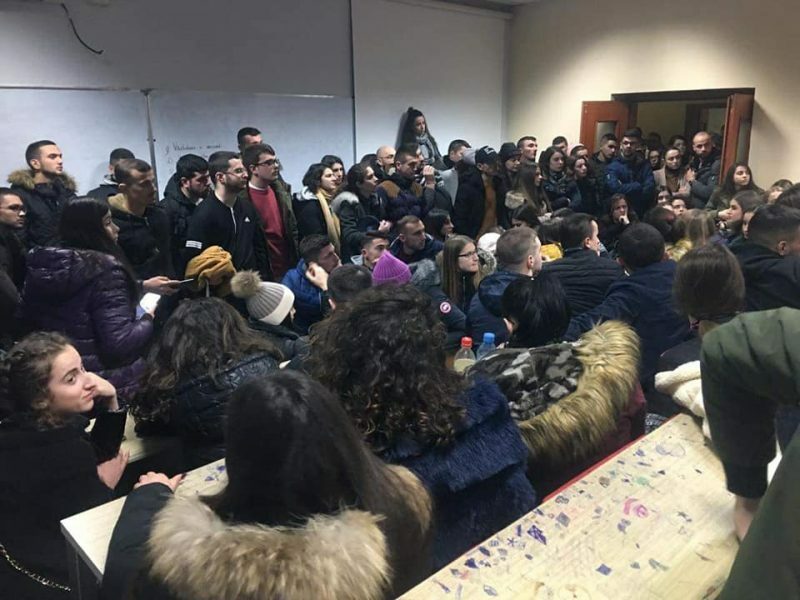 Today, students of the Polytechnic University of Tirana also joined the boycott and occupation. Despite having stated earlier that their boycott would end on Sunday, last night students announced from the Faculty of Economics that they would continue with the occupation in face of their unmet demands and the government not retracting the law on higher education. Occupying students said they will leave the doors open for those who want to have classes.